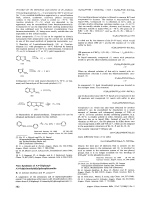 New Synthetic Reactions Based on the Onium Salts of Aza-Arenes [New synthetic methods (29)]. acid fluorides, olefins, allenes, carbodiimides, isocyanates, isothiocyanates, nitriles, and isocyanates. The possibility of performing stereospecific syntheses (involving configurational inversion) with onium salts deserves attention. carboxylic thiol esters from carboxylic acids and thiols without any assistance from an acid or a base? Table 1. Onium salts used and key to abbreviations. condensation reaction should be entropically advantageous. Table 2. Synthesis of esters from equimolar amounts of carhoxylic acid and a h hol with 2-chloro- (la) or 2-bromo-I-methylpyridiniumiodide (Ib) and tri-n-butylamine (3 h, reflux). esterification are shown in Table 2. 73, and 82%, respectively (Table 1). ( I n ) or ( l b ) and tri-n-butylamine (1 h, reflux in CH2C12). only chlorine and bromine derivatives give favorable results. partial reduction of carboxylic acids to aldehydes[']. the intervention of 2-acyloxypyridinium salts as an intermediate. The usefulness of 2-fluoropyridinium salts will be demonstrated in Section 2.1.3.
use of two moles of tertiary amine per mole of acid is necessary to scavenge hydrogen halide formed during the reaction. of carboxylic acids and alcohols or aminesl']. a molar ratio of i :2. [b] With tri-n-butylamine as base. ['I Lactone synthesis will be considered in connection with intermoleculardehydration because the most favorable procedure occurs in two steps. selectively without accompanying undesirable intermolecular lactide formation?, and ii) how can the lactonization reaction be performed under neutral or neutralization conditions? found one of the effective routes for lactonizing hydroxy carboxylic acids via 2-pyridinethiol (10) or 2-imidazolethiol esters, prepared by employing the above-mentioned oxidation-reduction condensation[*'. was therefore investigated with the expectation that the reaction would proceed smoothly and effectively. those obtained by previous methods (Table 6)113a1. lactones via 6-phenyl-2-pyridyl esters (14)[161.
lactones in reasonable but not entirely satisfactory yields. pyridinium ring to form 2-chloropyridine or 2-ammoniopyridinium salts. lactonized to dodecanolide (12d) in 85% yield. was obtained in 91% yield without racemization upon treatment of the hydroxy acid (16) with (lj),2,4,6-triphenylpyridine, and TEBA in refluxing dichloroethane. On use of 2,6dimethylpyridine the yield was 86%. R = n-C7H15, ~ - C ~ H ~ ~ C H = C H ( CCHH~3 0) zBC, C H ~ C H 2 . Using this method, DL-variotin (25), an antifungal antibiotic, could be synthesized in simplified manner, i e. without protection of the hydroxyl group[221.
anhydride and acid chloride is formed. 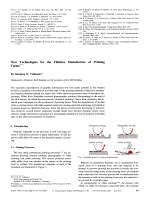 described above demonstrates the utility of the present macrolactonization process. with lactim ether or N-trimethylsilyl lactam'"]. However, little work has been reported on the preparation of N-acyl lactams directly from free carboxylic acids and lactim ethers. easily removed by washing with water. Table 8. Synthesis of allenes (28) from propargyl alcohols and Grignard comtetrafluoroborate (il). bromide which attacks only C-I (sN2 reaction) (Table 7)[261.
olefin in good yield (Table 9)[291.
with 1 -ethyl-2-fluoropyridinium tetrafluoroborate (fh) in boiling acetone. in the exclusive reduction of erythro-2-phenylthiocyclododecanol (30) and its threo isomer to trans- and cis-cyclododecene (31), respectively. 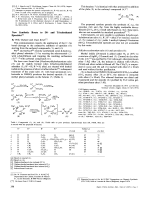 (28) was obtained in high yield (Table S)[281.
atom is suggested for 2-pyridiniooxyethyl sulfides (29). base or basic media) except when low valent titanium compounds are used as reducing a g e d 3 ' ] . 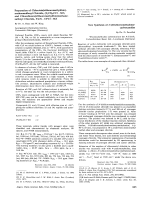 the presence of triethylamine to afford the corresponding alkyl chlorides in good yields. Addition of tetraethylammonium chloride improves the yield[321.
sugars and heterocycles utilizing the benzoxazolium salt (33). Table 10. Synthesis of alkyl chlorides from alcohols and 2-chloro-3-ethylbenzoxazolium tetrafluoroborate (33). -)-2dctanol with inversion of configuration. [b] Obtained from 3p-cholestanol with inversion of configuration. and (R)-(-)-2-octanol react with inversion of configuration. reacts with chloride ion in an SN2type process. 0-acetyl-P-D-glucopyranosylbenzimidazole(41) was obtained in 73% yield along with a trace of substituted glucopyranose (42). from (43) takes place easily to give the acetoxonium ion (44). type of phosphorylation has the advantage of avoiding pyrophosphate formation. nucleosides (41a-c) were prepared in high yields. used when compared with former methods. with acylated sugars in the presence of acidic catalyst~l’~~. nucleosides are produced in good yields under mild conditions without any assistance from heavy metals or acidic catalysts. high product selectivity. Thus no uncyclized product was detected when the reaction was carried out at low temperature. temperature, myrcene and ocimene were also formed in cu. 10-15% yield along with the cyclized products. than 10%) of farnesene (57). and rearrangements, from the acyclic precursors such as geraniol or farnesol. method provides a new entry among the biogenetic-like cyclization methods. obtained in good yield[42'.This is illustrated for phenylethanediol derivatives in Table 12. Table 12. Pinacol rearrangement with the 2-chloropyrimidinium salt (58) in 1.2dimethoxvethane (DME). with water (Table 13)[431.Rearrangement proceeds particularly smoothly when the pyrimidinium salt (58) is used; oximes are simply mixed with (58) (even in the absence of tertiary amine). p-toluenesulfonyl chloride in alkaline solution[u1. ( + Et3N) and (58). effective leaving group was further demonstrated in the following preparation of isothiocyanate and carbodiimide. treated with the 2-chloropyridinium salt (la) at room temperature, isothiocyanate is produced in high yield1451. method is of quite general utility; aromatic and aliphatic carbodiimides are obtained by a simple procedure. permits the preparation of ally1 isocyanates which are accessible only in low yield by conventional m e t h o d ~ f ~ ~ ] . Table 14. Synthesis of 1,2-dichloroalkanes from epoxides. [a] DL :meso = 77 :23. [b] cis:rrans= 98: 2.
the presence of triethylamine at room temperature it transforms carboxamides into nit rile^[^']. pyridine or chloroform for the completion of the reaction[541.
and stereospecific route to the cis isomers. p-Elimination reactions of N-substituted formamides leading to isocyanide formation are also possible utilizing (33). both aliphatic and aromatic formamide~[~']. Table 15. Synthesis of ketones from a-hydroxy carboxylic acids. immediately converted into a 2-alkyloxybenzoxazolium salt. The salt is in turn attacked by chloride ion to give the 1,2dichloroalkane. hydrolysis to afford the enantiomer of the starting alcohol. Table 16. Interconversion of enantiomeric alcohols using the oniurn salt (556). into (R)-(-)-2-octanol in 70% overall yield. The intermediate 2-alkyloxybenzothiazoliumsalt (see Section 4.1) also reacts with alkali metal halides to afford the alkyl halide in good yields (Table 17)[571.
reactions and a halide ion exchange are minimized. and onium salts can be found. dithiocarbamates (60); and (iii) reductive cleavage to thiols. [a] Starting material: DL-alcohol. [b] Starting material: (S)-(+)-alcohol. [c] Starting material: (R)-( -)-alcohol. -64.6 (I), -44.9 (Br), and -36.2" (CI). (R)-(-)-2-Octanethiol was obtained with complete inversion of configuration from an optically active alcohol, e.g. (le) and dithiocarbamate and subsequent reduction. The rotatory power of the thiol was [a]:= -32.7" (1.74, C,H,OH). converted into 3a-cholestanethiol in 97% overall yield. seems of particular synthetic importance. isomeric dithiocarbamate (SN2') was detected. stereospecific synthesis of primary amines from alcohols.
) 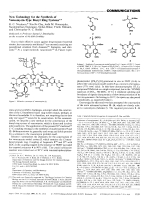 (S)-2-(2,6-~ylidinomethyl)pyrrolidine (656) and LiA1H4,were found to be efficient[661. [a] M. Asami. T. Mukaivama, unpublished results. side chain in (66), restricts the direction of approach of the ketones. dipyrrolidine derivative (67). e.e. = enantiomeric excess. with carbony1 compounds by using chiral ligand are very low (0-40%). [l] T. Mukaiyama, Angew. Chem. 89, 858 (1977); Angew. Chem. Int. Ed. Engl. 121 T. Mukaiyama, Angew. Chem. 88, 1 2 1 (1976): Angew. Chem. Int. Ed. Engl. T. Mukaiyama, M . Usui, E. Shimada, K. Saigo, Chem. Lett. 1975, 1045; K.
Saigo, M. Umi, K. Kikuchi, E. Shimada, T. Mukaiyama, Bull. Chem. SOC.Jpn. E. Bald. K. Saigo, T. Mukaiyama, Chem. Lett. 1975, 1163. J. K. Sutherland, D. A. Widdowson, J . Chem. SOC. 1964, 4650. T. Izawa, T. Mukaiyama, Chem. Lett. 1977, 1443. [81 R. Adams, I. J. Pachter, J . Am. Chem. SOC.74, 5491 (1952). I101 Y. Watanabe, S. Shoda, T. Muka(vama, Chem. Lett. 1976, 741. 1111 S. Yamada, Y. Yokoyama, T. Shioiri, J. Org. Chem. 39, 3302 (1974). [I31 a)E. J. Corey, K . C. Nicolaou, J.Am.Chem.Soc. 96,5614(1974);b)E.J. Corey. 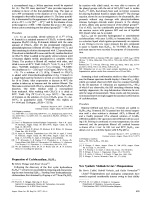 K. C. Nicolaou, L. S. Melvin, Jr., ibid. 97,653,654(1975); c) E. J. Corey, D.
J. Brunelle, Tetrahedron Lett. 1976, 3409. [I41 H. Gerlach, A. Thalmann, Helv. Chim. Acta 57, 2661 (1974). 1151 T. Mukaiyama, M. Usui, K. Saigo, Chem. Lett. 1976, 49. [I61 T. Mukaiyama, K. Narasaka, K. Kikuchi, Chem. Lett. 1977, 441. [171 K. Narasaka, M. Yamaguchi, T. Mukaiyama, Chem. Lett. 1977, 959. [181 M. Shiuno, T. Shibanuma, T. Mukaiyama, Chem. Lett. 1976, 1041. [191 K. Narasaka, K. Maruyama, T. Mukaiyama, Chem. Lett. 1978, 885. [2Ol A. Ishida, T. Bando, T. Mukaiyama, Chem. Lett. 1976, 711. [211 B. Stoll. W.Griehl, Helv. Chim. Acta 48. 1805 (1965); H. R. Krrcheldorf, E.
Leppert, Synthesis 1975, 592; M. Sakakibara, M. Matsui. Agric. Biol. Chem. A. Ishida, T. Mukaiyama, Chem. Lett. 1977, 467. I231 T. Mukaiyama, T. Tanaka. Chem. Lett. 1976, 303. 1241 T. Mukaiyama, S. Ikeda, S. Kobayashi, Chem. Lett. 1975, 1189. [251 S. Kobayashi, M. Tsutsui, 7 Mukaryama, Chem. Lett. 1976. 373. [271 T. Mukaiyama, M . Yamaguchi, K. Narasaka, Chem. Lett. 1978, 689. T. Mukaiyama, K. Kawata, Chem. Lett. 1978, 785. 1291 T. Mukaiyama, M. Imaoka, Chem. Lett. 1978, 413. [301 I. Kuwajima, S. Sato, Y. Kurata, Tetrahedron Lett. 1972,737; I. Kuwajima. M.
[311 Y. Watanabe, M . Shrono, T. Mukaiyama, Chem. Lett. 1975, 872. [321 T. Mukaiyama, S. Shoda, Y. Watanabe, Chem. Lett. 1977, 383. 1341 H. Paulsen, Adv. Carbohydr. Chem. Biochem. 26, 127 (1971). 1351 J. Dauoll, B. A. Lowy, J. Am. Chem. SOC.73, 1650 (1951). 1361 T. Saro, T. Shimadate, Y. Ishido, Nippon Kagaku Zasshi 81, 1440 (1961). [371 Y. Watanabe, T. Mukaiyama, Chem. Lett. 1978, 349. 0. Mirsunobu, K. Kato, J. Kimura, J. Am. Chem. SOC.91,6510 (1969); 0. Mifsunobu. M. Eguchi, Bull. Chem. SOC.Jpn. 44, 3427 (1971). 1391 S. Kobayashi, M. Tsutsui, T. Mukaiyama, Chem. Lett. 1976, 1137. 1401 S. Kobayashi, M. Tsutsui, T. Mukaiyama, Chem. Lett. 1977, 1169. (421 T. Mukaiyama, Y. Echigo. M. Shiono, Chem. Lett. 1977, 179. 1431 M. Shiono, Y. Echigo, T. Mukaiyama, Chem. Lett. 1976, 1397. 1451 T Shibanuma, M. Shiono, T. Mukaiyama, Chem. Lett. 1977, 573. 1461 T Shibanuma, M. Shiono, T. Mukaiyama, Chem. Lett. 1977, 575. [48l Y. Echiga, Y. Watanabe, T. Mukaiyama, Chem. Lett. 1977, 1345. York 1967, p. 1172;S. R. Sandler, W. Karo: OrganicFunctionalGroup Preparations. Vol. 1. Academic Press, New York 1968, p. 307. 1501 T. Mukaiyama, Y. Echigo, unpublished. [511 Y. Echigo, Y. Watanabe, T. Mukaiyama, Chem. Lett. 1977, 697. 1521 I. Ugi: Isonitrile Chemistry. Academic Press, New York 1971, p. 29. I531 Y. Echigo, Y. Watanabe, T. Mukaiyama, Chem. Lett. 1977, 1013. [541 W. Ziegenbein, K.-H. Hornung, Chem. Ber. 95,2976 (1 962); J. R. Campbell, J.
K . N. Jones, S. WoKe, Can. J. Chem. 44,2339 (1966); N. S. Isaacs, D. Kirkpafrick. Tetrahedron Lett. 1972, 3869. 1551 T. Mukaiyama, Y. Echigo, Chem. Lett. 1978, 49. 1561 T. Mukaiyama, K. Hojo, Chem. Lett. 1976, 893. 1571 K. Hojo. T. Mukaiyama, Chem. Lett. 1976, 619. 1581 J . S. Filippo. Jr., L. J. Romano, J. Org. Chem. 40, 1514 (1975). C. K. Ingald: Structure and Mechanism in Organic Chemistry. 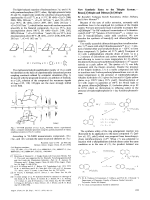 Cornell University Press, Ithaca 1969, p. 517: H. M. R. Hoffmann, E. D. Hughes, J . Chem. K. Hojo, H. Yoshino, T. Mukaiyama, Chem. Lett. 1977, 437. 1621 G. L. O'Connor, H . R. Nace, I. Am. Chem. SOC.75, 2118 (1953). D. A. Swann, J. H. Turnbull, Tetrahedron 20, 1265 (1964). 1641 a) 0. Mifsunobu,M. Wada, T. Sano, J. Am. Chem. SOC.94,679 (1972); b) D.
Bull. Chem. SOC.Jpn. 44, 2797 (1971). 1661 T. Mukaiyama, M. Asami, J. Hanna, S. Kobayashi, Chem. Lett. 1977,783; M.
1671 S. R. Landor, B. J. Miller, A. R. Tachell, J. Chem. SOC.C 1966,2280; C 1967. (681 S. Yamaguchi, H. S. Mosher, 1. Org. Chem. 38, 1870 (1973). [69l A. I. Meyers, P. M. Kendull, Tetrahedron Lett. 1974, 1337. 1701 S. Yamaguchi, f Yasuhara, K. Kabuto, J. Org. Chem. 42, 1578 (1977). 1711 a) W French, G. F. Wright. Can. J . Chem. 42, 2474 (1964): b) H. Nozaki, H.
M. E. Ford, Tetrahedron Lett. 1974,1341; d) N. Allentoff, G. f Wright, J . Org. Chem. 22, 1 (1957); e) T. D. Inch, G. J. Lewis, G. L. Sainsbury, D. J. Sellers. Tetrahedron Lett. 1969, 3657. 1721 D. Seebach, H. 0.Kalinowski, B. Bastani, G. Crass, H. Daum, H. Doerr, N. P.
DuPreez, Y. Ehrig, W. Langer, C. Nussler, H. Oei, M. Schmidt, Helv. Chim. Acta 60, 301 ( 1 977). 1741 H. J. Brauer, R. Huller, Tetrahedron Lett. 1972, 5227. Sato, K. Soai, K. Suzuki, T. Mukaiyama, ibid. 1978, 601.
study of its several not yet unambiguously defined mechanistic aspects. ous examples have been found of the reverse reaction of 1,3dipolar cycioaddition, i. e. [5+3 + 2][1211,3-dipolar cycloreversion. Scheme 1 exemplifies the cycloadditions of dipolarophiles with octet-stabilized"' 1.3-dipoles of the ally1 and propargyl-allenyl type and the corresponding cycloreversions["'. are apriori possible. (a)-(e), see text.